BELIZE – San Jose/San Pablo - Today we learned that a major Mayan Monument had been bulldozed for roadfill aggregate. Noh Mul. it’s name means the Big Hill but it’s not so big any more, this once towering and stout ceremonial center in San Jose/San Pablo has been whittled down to a narrow core by excavators and bulldozers. Whodunnit? Contractors who’re using the rich gravel and limestone content to fill roads in nearby Douglas Village. Now, this was the main temple, the ceremonial center for Noh Mul, at about 20 metres among the tallest buildings in Northern Belize - and it’s not centuries old, it’s millennia, thousands of years old and the thought that it’s rich limestone bricks cut with stone tools in the BC era, the thought that this could be used for road fill is a manifest outrage and a particularly painful one for these Archeologists who were called out to the area today. INDE – Vijayawada - One of the three famous Mogalrajapuram caves in the City is being totally neglected by the Department of Archaeology (DoA). 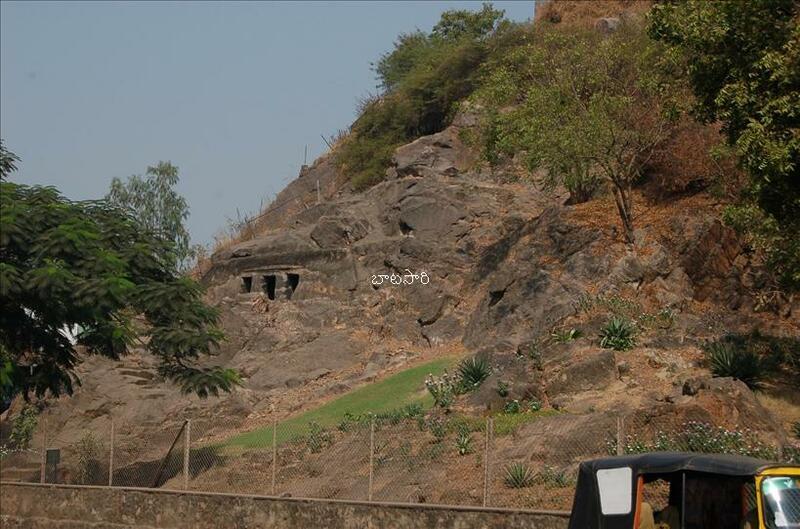 The three caves -- located at Mogalrajpuram and Kasturibaipeta here - are popularly known as Mogalrajpuram Caves and have historical significance. These caves, built in the 5th or 6th century AD, were declared to be of national importance under the Ancient Monuments and Archeologicial Sites and Remains Act of 1959. The DoA has erected a fence to protect the historical caves. These beautiful caves were brought to a shape by Akkanna and Madanna, the famous ministers of the Qutb-Shah (1611 A.D.-1672 A.D.), the Nawab of Golconda. But, historians claim these caves belong to 6th and 7th century AD and were built along with the Mogalrajpuram Caves. CHINE - Archaeologists revealed Monday that the divination rituals used by ancient Chinese thousands of years ago may have featured some behind-the-scenes trickery. During the Shang Dynasty (1600 BC -- 1046 BC), emperors relied heavily on prophecy and divination to help them make decisions on matters ranging from domestic policy to the meanings of their dreams. One divination technique involved burning turtle shells or cattle bones, with the diviner predicting the future based on the patterns of cracks left in the materials after burning them. "We have learned from our experiments that the appearance of certain crack patterns is basically controllable," said Hou Yanfeng, a researcher at an archaeology laboratory under the Henan Provincial Administration of Cultural Heritage. "During the Shang Dynasty, the emperor was the leader of the diviners. Thus, it is possible that he controlled public opinion via oracle bone divination," he said. Ma Xiaolin, deputy director of the administration, said researchers made replicas of oracle bones excavated from central Henan and carried out a month's worth of experiments to figure out precisely how they were created and how they were used in divination. "Based on saw, cut and burn marks on 185 fragments of oracle bones and shells, our researchers gained insight into the manufacturing techniques that were used to make oracle bones during the late Shang period," Ma said. The experiments have been recognized by experts from the U.S., France and Spain, Ma said. The lab went into operation in 2005 and has participated in major archaeological research projects. NOUVELLE ZELANDE – Hokianga - The archaeology of the Hokianga area is fascinating. "The Hokianga incorporates some of the earliest Maori oral history traditions - including those relating to Kupe - which are really important from the perspective of the history of Northland and New Zealand. The intertwining of these oral histories with archaeology is always fascinating. The Hokianga also has a strong history of early contact between Maori and Pakeha, as well as the development of industries like timber milling and ship-building. USA - Rattlesnake Valley - Before summer wildfires chased them off the upper Rattlesnake last summer, archaeologists discovered a lithic scatter site and a 2,000-year-old projectile point. A University of Montana archaeology team, in conjunction with the Lolo National Forest, will return to the region this summer to complete the second leg of their two-year study. ::Log cabins and dams — historic by today’s standards — have been documented throughout the upper Rattlesnake. Yet little is known about the area’s prehistoric visitors, who frequently traveled old mountain trails connecting western Montana’s sweeping valleys. “All the historic European American sites have been documented up there — a lot of cabins, a lot of historic dam construction,” said Douglas MacDonald, an associate professor of anthropology at UM. “No one has every looked up there for prehistoric Native American sites.” Bacon said the Lolo National Forest has long been interested in the human history of upper Rattlesnake. Native Americans crossed the mountains during forays between the Flathead and Missoula valleys. If archaeologists ever got around to exploring the area, it only made sense they’d discover something significant. The university team launched its survey last summer, working the southern and western flanks of the upper Rattlesnake before being chased out by summer wildfires. “They found a prehistoric site on a saddle above one of the lakes,” Bacon said. “They found pieces of chip stone. Whoever was working up there used it as a tool manufacturing area.” Bacon described it as a lithic scatter. Small fragments of chipped stone were recorded over a small area, suggesting someone long ago had sat down to carve a tool. “Whoever was working up there used it as a tool manufacturing area,” said Bacon. “What we suspect with these kinds of lithic scatters, they were probably using them to make a small point to attach onto an arrow to get smaller game.” The team also recorded a projectile point dating back 2,000 years. Bacon and MacDonald said any Native American artifacts located during their survey are left on site per an agreement with the Confederated Salish and Kootenai Tribes. 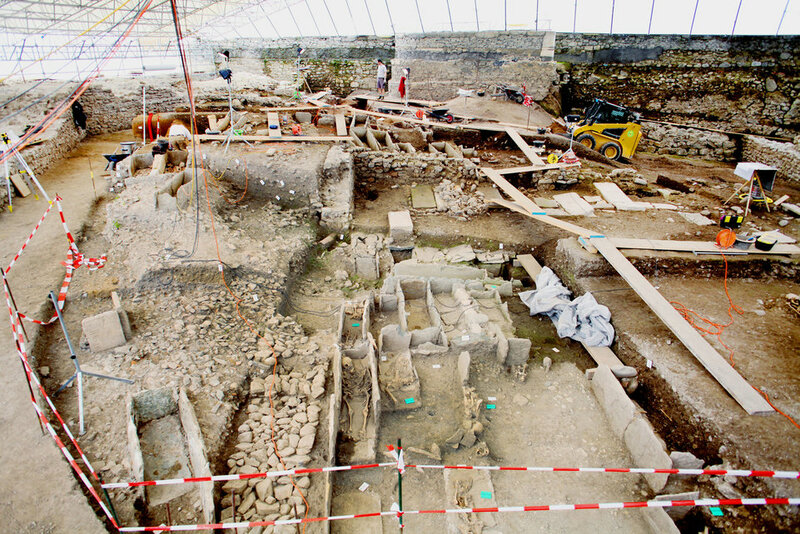 SUISSE – Genève - La découverte archéologique est majeure. Et met fin temporairement aux travaux de réaménagement de l’esplanade de Saint-Antoine. Niché en Vieille-Ville, à quelques pas seulement du Musée d’art et d’histoire, le cœur du bastion de Saint-Antoine a révélé l’existence du «mottet» de Saint-Laurent (ndlr: vaste plate-forme édifiée en 1537 pour disposer les pièces d’artillerie) ainsi que la présence d’une église funéraire datant du VIe siècle. Mais pas seulement. Puisque l’on y a retrouvé plus d’une centaine de squelettes — dont certains ont été inhumés dans des coffres de dalles au cours de l’époque mérovingienne — et même un «quartier» romain du premier siècle! De quoi pousser la Ville de Genève à prolonger les fouilles jusqu’à la fin de l’année. 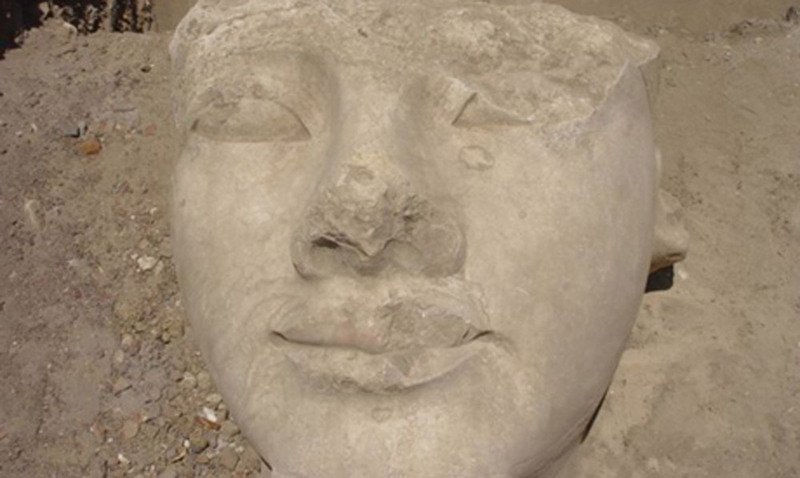 EGYPTE – Akhmim - The limestone head which was once part of a colossal statue of Ramesses II has been removed from its original spot in Akhmim, Middle Egypt, over concerns about its safety. The head was uncovered six years ago within a modern cemetery situated on an area which is believed to have housed a temple commissioned by Ramesses II. Due to the research activity which had to take place, the area was proclaimed an archaeological site and the cemetery was relocated. Still, since January 2011, all work was put on hold while the poorly guarded area has been used as a garbage dump. Akhmim (ancient Panopolis), was the capital of Upper Egypt’s 9th nome and the cult centre of the fertility god Min.